Yoli Ouiya, noted as the “Queen of Green” by Black Enterprise Magazine, is a Green & Healthy Living Expert and Green Chef. She currently operates a green and natural lifestyle website YolisGreenLiving.com and boutique eco-lifestyle outfit Yoli’s Green Living Group. 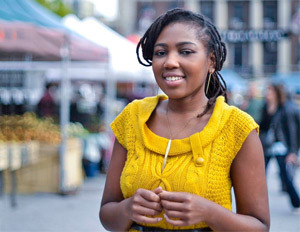 Black Enterprise included Yoli in its “Top 20 National Bloggers” of 2012, was named ‘Best in Green Living” by AllParenting.com, and listed as “Top 17 Black Woman Bloggers to Watch in 2013″ bu ForHarriet.com. With a certification in Plant Based Nutrition from Cornell, she offers workshops, lectures, and organizes a variety of eco-chic green themed events in New York. She is currently on the board of directors for The New York Coalition for Healthy School Food, a health and nutrition specialist for Harlem Children’s Zone, and co-authoring a book slated for completion Spring 2014.